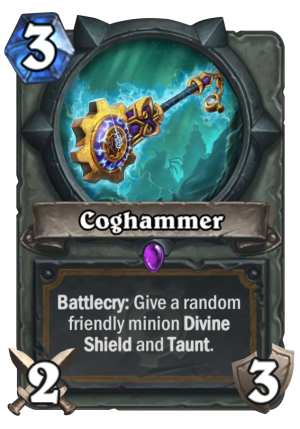 Coghammer is a 3 Mana Cost Epic Paladin Weapon card from the Goblins vs. Gnomes set! Battlecry: Give a random friendly minion Divine Shield and Taunt. So you ripped this out of a machine, carved some runes on it, stuck it on a handle, and now it's a weapon of great divine power? Seems legit.